SpONSOR is an AAL funded project. It aims at developing, testing and implementing an ICT platform that facilitates the posting, browsing and exchange of key information between competence-offering seniors and search-based requests, from competence-demanding organisations from the public, private and voluntary sectors. 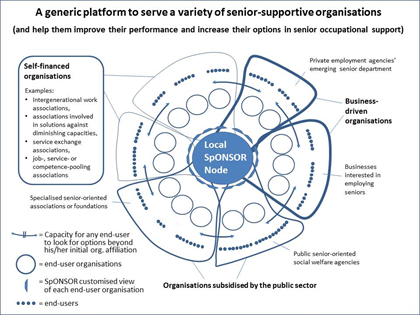 SpONSOR will significantly enhance senior persons’ access to a wide range of occupational positions, thus meeting the AAL Call 6 goal for supporting sense-making and the well-being of seniors in occupational environments whenever possible. Funded by AAL Programme	| Theme: shizzo by Tidyhive.